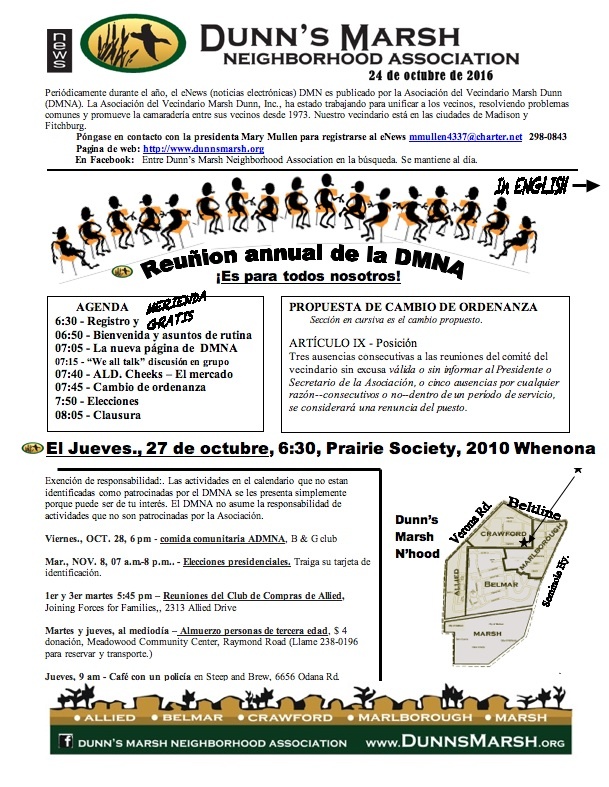 REMEMBER our DMNA Annual Meeting tonight, October 27, 2016, 6:30, at Prairie UU Society, 2010 Whenona Drive. It starts with a free soup and sandwich meal. 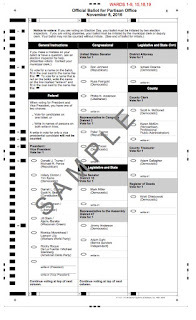 6 - What’s on the Ballot? NOTE: All articles by Mary Mullen unless noted otherwise. WARNING: This e-News was not proofread. We have just learned that Zimmer's Liquors store has been sold to a new owner and that owner wants to open his own liquor store in the building at 4217 West Beltline Highway. Several meetings will be held to determine if the new owner will be issued a liquor license. Issues and actions related to this location and the new application will undoubtedly be discussed at the DMNA’s Annual meeting this Thursday, October 27, 6:30 pm, at Prairie UU Society, 2010 Whenona Drive. Come to the meeting and let everyone know what you think. We’ve been told that the new owner thinks it will be a breeze to get a license, but if people in the neighborhood all rise up, get petitions out, and attend all the meetings, liquor sales could be eliminated from this location. There have been many, many complaints about issues related to liquor sales in the neighborhood. Liquor bottles and cans are strewn all along the frontage roads and a block back from the frontage road and also into Marlborough Park, 4 blocks from the store. People with paper bags covering their bottles are often seen walking into Marlborough Park. Drunken people have passed out in residential yards nearby. 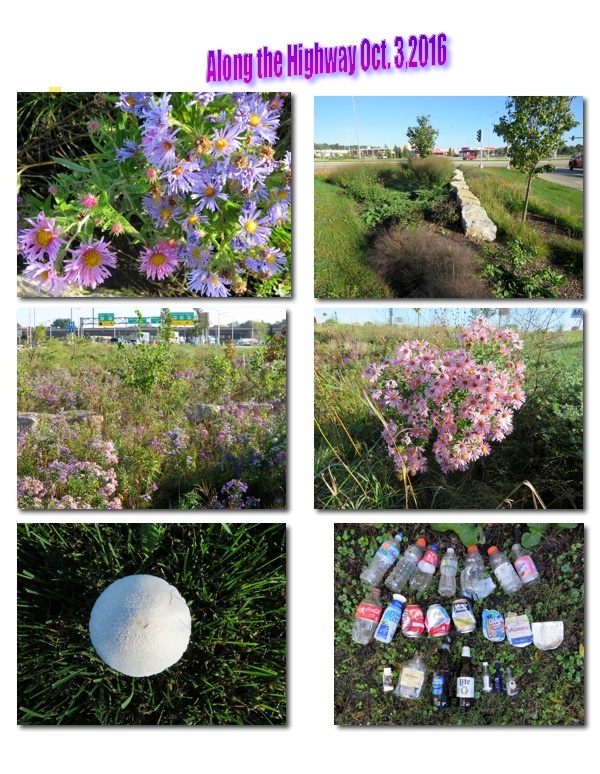 (1) Thursday, Nov. 3, 11:00 am, an "informational meeting" at the store, 4217 West Beltline. (2) Wednesday, November 16, at 5:30 pm with the Alcohol License Review Committee, Municipal Building on Dr. Martin Luther King Jr. Blvd. (3) Tuesday, December 6, , 6:30 pm, City-County Building on Dr. Martin Luther King Jr. Blvd., is the date the City Council is expected to make a decision on the license. Your DMNA President has posted a message to Alder Maurice Cheeks informing him of this issue and mentioning that she is sure the neighborhood will be opposed to issuing a license to the new owner. Alder Cheeks is scheduled to attend our neighborhood association's meeting this Thursday, 6:30, at Prairie UU Society, 2010 Whenona Drive. This would be an opportunity to let him know what you think. MANY people in the neighborhood should attend each meeting if the neighborhood wants to stop the new owner from getting a liquor license. People may also favor the licence at this meeting. We have been highly successful in getting the City of Madison to turn down 3 applicants for liquor licenses in the neighborhood in the past few years. The first two came in at about this time of year in 2009. One was an application to sell alcohol at a restaurant at 4245 West Beltline Highway where Dream Bikes is now located. This would have been at a restaurant with sales and consumption only on the premises. The second was an application to sell bottle goods and to serve alcohol at a to-be-established restaurant at 4265 West Beltline Highway, just 2 doors west of the first one. That is the house at the corner of the Beltline Frontage Road and Danbury Street. Both were turned down after neighborhood opposition. Two years later, November 2011, an application was made for a very large liquor store to be located in Madison Plaza - the shopping center where Lumber Liquidators, AutoZone, and Harbor Freight are. The address was 4611 Verona Road. Again, the Alcohol License Review Board turned down the application after strong neighborhood and elected representative opposition. Phil Zimmer (owner of Zimmer's for 35 years) told me that he feels that the new owner bought the building specifically so he could toss out Zimmer's and put in his own liquor store. Phil added that the new owner gave him an ultimatum of selling the business to him and selling all his stock as well - both as rock-bottom prices - "or else." He was given one day to "think it over." He did sell, but he is very, very unhappy at how he was treated by the new owner of the building. Annette Shesman has started a petition opposing granting of a liquor license for 4217 West Beltline Highway. If you are on Nextdoor Dunn’s Marsh, go to the posting “Liquor Store Petition” to contact her or sign the petition. 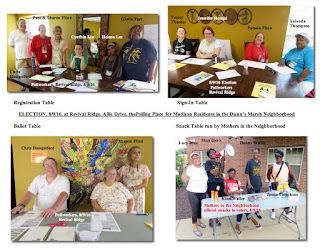 We will also have a petition at the Dunn’a Marsh Neighborhood Association’s Annual Meeting, Thursday, October 27, 6:30, at Prairie UU Society, 2010 Whenona Drive (enter on Crawford Drive). Dunn’s Marsh neighborhood residents. I have a huge apology to make about the Dunn’s Marsh Neighborhood News flyer that you have probably received this past weekend. Would you believe that 2 of us looked at the calendar portion of the flyer and neither of us noticed that the wrong date was given for the preseidential election. The correct date for the presidential election is Tuesday, November 8 (not Nov. 18). Remember that in Madison, you can vote using an in-person absentee ballot until November 4 at any library or at the City Clerk’s Office in the City County Building. Take your photo ID. Fitchburg voters can vote early at the Fitchburg City Hall on Lacy Road. Friday, November 4 is also the last date you can early vote there. 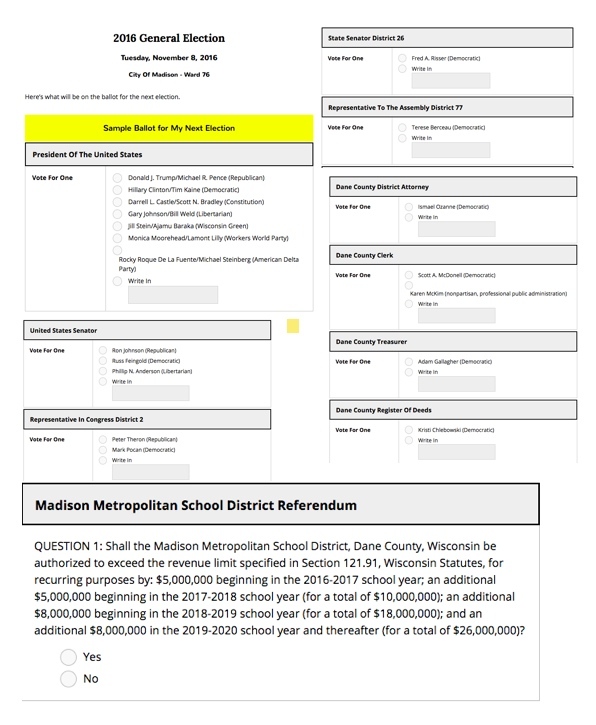 The City of Madison has already broken all of its absentee voting records with this election. Don’t be surprised when you get into the voting booth. There’s way more than the Presidential candidates to vote for. In both Fitchburg and Madison there U.S. Congressional candidates, State legislative candidates, and County candidates. 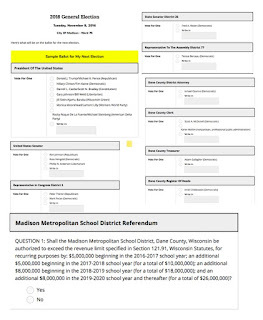 Madison voters also have a school referendum. Look at the attached ballots. Ford’s lecture highlights the intersection of architecture and hip hop culture through three interconnected realms: academic research, professional practice and media. The lecture will include the built environment’s link to the start of hip hop culture, while also exploring ways in which this musical genre contributes to the built environment. He will share his work with The Universal Hip Hop Museum in the Bronx, NY, and unique approaches to empowering underrepresented communities through innovative architectural education techniques. Michael Ford, The Hip Hop Architect, is originally from Detroit, Michigan. He has worked as a designer at Hamilton Anderson Associates in Detroit and at Flad Architects in Madison, and is currently an instructor at Madison College in the Architecture Technology department. Ford has presented on hip hop architecture throughout the U.S., including the University of Pennsylvania, Carnegie Mellon University, and his alma mater, University of Detroit Mercy. FREE ticket required for admission. Tickets are available subject to venue capacity and are issued on a first come first serve basis. If not sold out, tickets will be available at the event starting at 6:30pm. Yes, it’s that time again. Time to gather for the annual Dunn’s Marsh Neighborhood Association’s Annual Meeting. Also, time to have a free meal together. Yeah! This year, we promise to be very disciplined about the time -- and anyone and everyone can take responsibility for holding us to the printed agenda. Come prepared to tell us one thing you like about our neighborhood and one thing you’d like to see the Dunn’s Marsh Neighborhood Association work on during the coming year. There are two other major orders of business is to consider at this meeting: a bylaw amendment and election of the Neighborhood Council. For the past 2 years we’ve had trouble getting a quorum at Council meetings. The suggested bylaw amendment makes it clear that a Council member who shows a lack of ability or interest in attending meetings is automatically “resigned” from the Council. We need to have Council members who can attend our meetings regularly, not just once in a while. 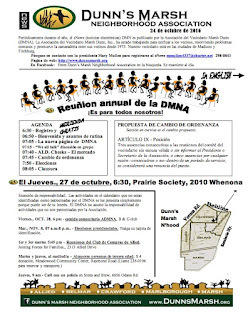 The new Council will be chosen from “caucuses” of DMNA members from the 4 parts of the neighborhood. Each area - Crawford, Belmar, Marlborough, and Allied - may choose up to 3 representatives. Officers are chosen at the first Council meeting after the annual meeting. 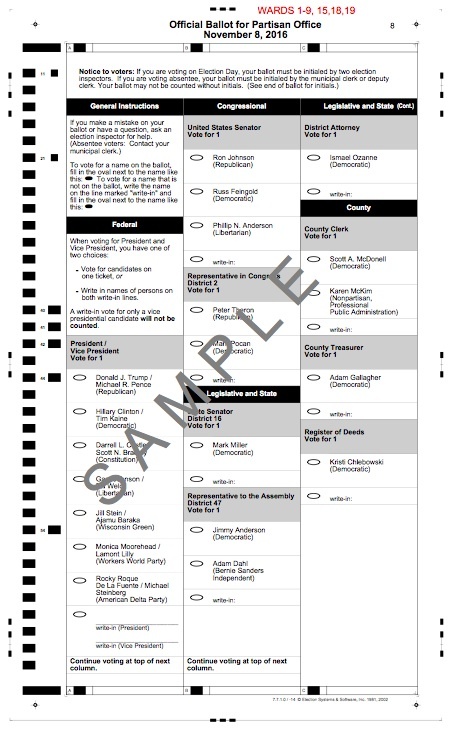 Voting early in person by absentee ballot just got a lot easier. After a court ruling that allowed municipalities to establish absentee voting locations beyond just the clerk’s office, the Madison Common Council decided to make Madison Public Libraries into absentee voting locations. Voting at the libraries started Monday, September 26. The nearest libraries to the Dunn’s Marsh Neighborhood are Meadowood on Raymond Road, Sequoya at Tokay and Midvale Boulevard, and the Monroe Street Branch on Monroe Street. Closer to the election - from October 31-November 4, voters may also fill out their ballots at Edgewood College - Wingra Commons and UW-Madison - Union South. Voters must still show an approved picture ID such as their Wisconsin license or official Wisconsin ID or a number of other specific picture IDs. Voters who haven’t registered at their current address or who have changed their names may also register at the libraries. Be sure to bring proof of where you live such as a utility bill or bank statement with your name and address on it. An ordinary letter is NOT proper proof. The November 8 election for Madison voters in the neighborhood is in the Revival Ridge community room. Summer and fall, doesn’t matter when, there’s beauty to be found in the neighborhood. Take a look at the collages to get a flavor of the seasons. On Saturday, September 10, a neighbor witnessed 3 young men steal their neighbor’s pitbull pup. The neighbor put a notice up on Nextdoor Dunn’s Marsh, and the police were also informed about the theft. Assuming that the thieves were hoping to make money selling the dog, the owner kept watch on Craigslist. That was the ticket: sure enough, the dog came up for sale there. The owner arranged to meet the dishonest sellers - but not at his home. (Always a good idea to meet strangers at some public place instead of their home or yours) Probably the police were also invovled. The pup is now back with his rightful owners. A very happy ending to a sad story. The Little Free Library at Lumley and Danbury will soon be moved to a location along Crescent Road. DMNA Council member Elvice McAlpine has been working with Rick Eilertson of Fitchburg on this move. 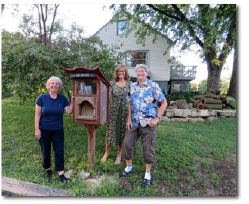 The photo shows Elvice on the left side of the library two other Council members, Thea Bach and Mary Mullen on August 30. We are hoping the move will take place soon, before the ground freezes. The move is necessary because at the current location, the LFL has been repeatedly vandalized. One of the persistent questions we receive at the Streets Division is how to recycle more cardboard than will fit into the cart. We’ve recently created a webpage http://www.cityofmadison.com/streets/recycling/CardboardExcess.cfm that spells out the rules on how to handle this all too common issue in the age of online shopping. Did you know that you can recycle your household batteries at our drop off sites? It’s true! We accept alkaline batteries, rechargeable batteries, lead acid batteries, and even lithium batteries. However, there are two very important steps to follow before recycling your lithium batteries. Lithium batteries come in many different shapes and sizes, but they are very easy to identify. Lithium batteries are the small flat round batteries often found in watches and hearing aides. The batteries that power our cameras, phones, and laptops are also often lithium. Lithium batteries will be clearly labeled with the word "Lithium" or "Li-ion". Here are the two steps to recycling these batteries. First, we need folks to help us keep lithium batteries separate from the other battery types. Each drop-off site has two battery containers – one for lithium batteries, and one for the alkaline and rechargeable. Please put the lithium batteries in the correct container. There will be a large banner that will direct you which container to use for your batteries. And there is staff available to help if it is not clear. The second important step would be to encase lithium batteries in clear tape prior to dropping them off. Packing tape works best for this. You can go to our website to see an example of how to tape up your batteries prior to recycling them. And finally, as a reminder, do not place televisions at the curb for collection. Televisions, and other electronics that are banned from the landfill, should be taken to one of our drop off sites for recycling. Even electronics that are not banned from the landfill can be recycled at the drop off sites. Televisions should not be placed at the curb because they contain hazardous material, like lead and mercury. If their screens are broken at the curb, that hazardous material could spill into the gutter then down the storm drains and into our lakes. To recycle your television, you need to obtain a $10 appliance sticker for each one. You will then need to bring the television to one of our drop-off sites. To obtain the $10 sticker, you can stop by any city of Madison public library, the offices of either Streets Division location, or the Treasurer’s office. You can even buy them online at www.madisonpay.com (Note: you will be mailed the sticker after the online purchase – there is no print on-demand option.). Keep in mind that the drop-off site hours change seasonally, so be sure you know if we’re open before coming out. Right now, the drop-off sites are open 8:30am to 4:30pm seven days a week and until 8:00pm on Tuesdays and Thursdays. As always, please contact us if you have any questions. Our offices are open 7am to 4pm Monday to Friday. If you live east of S. Park Street, and that includes the all of the isthmus, you should call 608-246-4532 for the east side Streets Division. If you live west of S. Park Street, which includes the area around Camp Randall, you should call 608-266-4681. 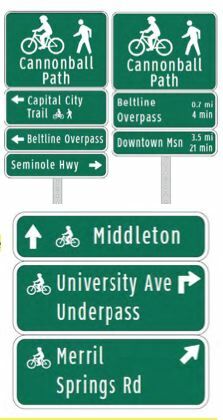 Dane County Parks in partnership with the Madison Area Transportation Planning Board contracted with Toole Design Group to develop a county wide Bicycle Wayfinding Manual to guide the planning, design, and installation of wayfinding signage to assist bicyclists. Bicycle wayfinding is intended to provide navigational assistance to make it easier to follow designated bicycle routes and reach important community destinations. Some bicycle routes may not be intuitive and wayfinding signage makes it simpler to use the route without needing to stop and consult a map. In addition, wayfinding helps bicyclists navigate to popular destinations such as shopping districts, schools, and parks that often are located just off a path or on-street route. Wayfinding can also encourage more people to bicycle especially if they were not aware of how close a destination is to their home or that there is a bicycle route to that destination. Hills Park to CTH Q Wayfinding signage developed for project. The sample plans serve as a way for communities to see how various types of infrastructure will look when signed. The sample plans include a variety of typical situations including both urban and rural paths, side paths next to a bike lane, and other on street bicycle routes. To further assist communities Dane County Parks and the Madison Area Transportation Planning Board will be offering a workshop implementing the Bicycle Wayfinding Manual and designing a corridor signage plan. The workshop will be held later this year. Interested attendees can email the Madison Area Transportation Board to be placed on a list to be notified when the workshop is scheduled. 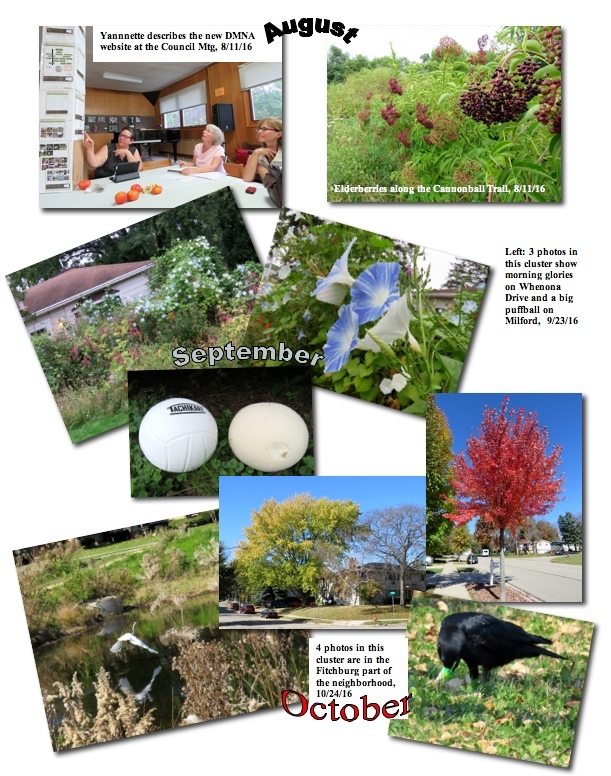 More information on the Dane County Wayfinding Plan is available on the Dane County Parks webpage. We live in a compassionate, caring community. It’s core to our quality of life and helps make our neighborhoods the very best they can be. Homelessness is a real challenge facing too many families not only here, but in growing communities across the country. What makes us unique is the way we are coming together to make a real difference for our neighbors. With a site now secured, we are working diligently with the City, United Way, Catholic Charities and others to develop a new Day Resource Center to help individuals who fall on hard times get back on their feet and find employment. This new one-stop-shop is slated to open next summer once remodeling is complete. In addition to connecting those who are homeless with the vast array of services our community offers, it’s important we continually focus on what can be done to prevent homelessness before it occurs. Too often families working hard to support their loved ones come upon a car repair or other significant expense making it hard to pay rent. That’s why I created the “Eviction Prevention Program” through Dane County Joining Forces for Families – to stabilize living situations for families with children. We are on track to help 200 families and 400 kids this year. Given demand, I am doubling the dollars for this effort to $100,000. Working with the Salvation Army, the County is providing nearly $1 million for emergency shelter and to support a new expanded “Rapid Re-Housing” initiative to secure permanent housing for dozens of individuals. Once housing is found, “Rapid-Re-Housing,” empowers homeless individuals with the training and skills to stay in those residences. That’s why I’m putting more county dollars into case managers for the coming year, people who can work directly with those with housing challenges to get them into and keep them in affordable housing. Together, we are making a real difference.